Between the autumn of 1943 and the spring of 1945 the German Army (Wehrmacht) managed to delay the Allied advance in Italy, thereby rendering almost stationary the southern front of "Fortress Europe". The military reasons for this undoubted success were many, such as the tactial know-how of the German commander Albert Kesselring, the difficulties posed by the mountainous terrain of the Appenines, the divergences of opinion amongst the Allied commanders and the invasion of France, which took away from the peninsula the most experienced troops and an enormous quantity of military material. As well as all these reasons, there was the large-scale exploitation of the local labour force, used not only to build fortifications along the front but also in factories, at the airports, in the countryside and practically in any activity which contributed to the war effort. The Germans had a long experience of using forced labour in the territories they had occupied. In Eastern Europe they used extremely violent methods which amounted to reducing millions of "lesser mortals" to slavery, both there and in Germany itself. It has been calculated that at the end of the war there were 8.5 million forced labourers in the Reich, most of whom came from Poland and the Soviet Union. In Western Europe other methods were employed. Even if hundreds of thousand of prisoners of war and political prisoners had been forced to work in the Reich, generally speaking the methods used in Western Europe, and desired by the plenipotentiary for economic affairs, Albert Speer, were different. The line followed by Speer, in France as well as in Italy, was that of expoiting the local resources in situ by means of a series of agencies, amongst which was the Todt Organisation which specialised in the building of infrastructures, and through direct agreements made with the major industries of the occupied countries. Alongside Speer's ministry, however, there was another organisiation, directed by the plenipotentiary for the recruitment of labourers, Friz Sauckel. The scope of this organisation was to send to Germany, willingly or unwillingly, as many workers as possible. Lastly there was the Wehrmacht, which in its own right had offices dealing with economic affairs and needed thousands of labourers for its work sites. Straight after the occupation of Italy all these agencies established themselves there, hoping to fulfil their own objectives. The Repubblica Sociale Italiana (RSI – Italian Social Republic), in attempting to slow down the indiscriminate expoitation of the workforce, which not only deprived it of potential soldiers but also strongly limited its authority, created its own organisation, the Ispettorato Militare del Lavoro (Military Labour Inspectorate), with the scope of recruiting workers and supplying a labour force to the Wehrmacht. Through these organisations hundreds and thousands of labourers were forced to work for the German Reich, thereby enabling the drawing-out of the war and the occupation of foreign territories. 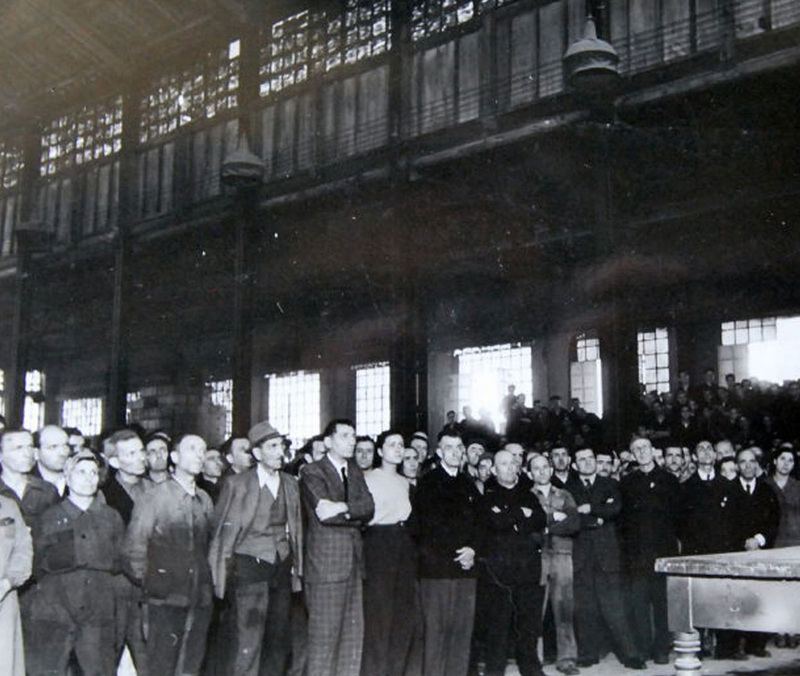 According to a calulation made in 1944, 175,00 workers were employed in the Todt and almost 50,000 in the Military Labour Inspectorate (the so-called Paladino Organisation), a total of 225,00 labourers to whom must be added those employed directly by the Wehrmacht and by other smaller organisations set up by important local fascists. Other than on the Gustav and Gothic Lines, a large number of men were engaged in the construction of roads, bridges, airrports and coastal fortifications, as well as working in factories "protected" by the Germans. Working conditions varied from zone to zone, from work place to work place, and being employed in those cities which had been bombed or were near to the front line was not without danger. Despite this, hundreds of men preferred being used as forced labour rather than running the risk being deported to Germany or finishing up in the ranks of the army of the Social Republic.